We have one goal: to receive the ISSMA All Music Award for Choral this year! The HS Choir is the primary vehicle for music instruction. All Choirs are based on the grade level of the student. These ensembles perform a number of official concerts during the school year and may also participate in Indiana State School Music Association events in the spring. 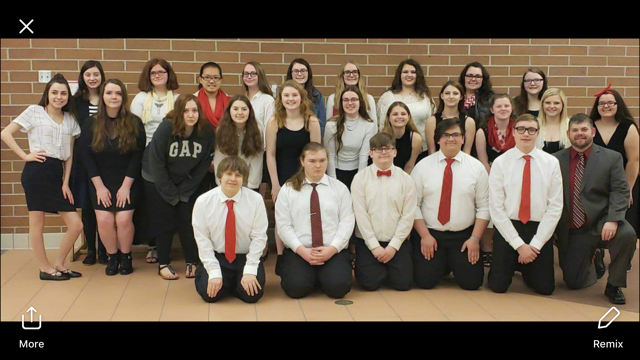 High School Choir is based on the Indiana Academic Standards for High School Vocal Music. This course provides students with a balanced comprehensive study of music through the concert choir, which develops skills in the psycho-motor, cognitive, and affective domains. Ensemble and solo activities are designed to develop elements of musicianship including tone production, technical skills, intonation, music reading skills, listening skills, analyzing music, studying historically significant styles of literature, and integration of other applicable disciplines. The Music Department full year calendar can be found here.